Pyro passed 3 out of 3 obediece trials to earn his CD, giving him his Versatility title, the 14th Versatility completed for our GSMD's! Brothers Henri, and Ragnar finish thier Championships and then their Grand Chapionships in a flash! Henri at his first show goes best of winners for his pfirst major, at show #2 takes the breed over specials for a 5 point majoar and a working group 3! Sister flare takes another major win. Dune passed the open Draft test, making her the 10th Swissy in history to achieve the VGSX distinction! "Hank" goes best puppy in sweepstakes! Marlo finishes her Championship and finishes her VGS! Dune passes her 3rd led in open obedience earing her CDX! Marlo finishes her Championship and CD earning her VGS! Marlo earns her Herding Pre-Trial Tested (PT) on Geese and ducks on January 14th. In obedience Marlo 1st leg in Novice and Roma 2nd leg in Begunner Novice. 2016 Year in review: 2016 was a busy year for working events. We had three of our Swissies achieve their Versatile Greater Swiss Titles (VGS) Yuri, the oldest Swissy in history to achieve a "VGS", followed by "Dune", and "Dee" are now added to the ever growing list of Versatility Acheivers! National Specialty winners, Pyro with and Award of Merit, 8 month old Flare Best of winners and best puppy! 2015 has been a very busy year we hosted 2 pack hikes on Long Island, finished 5 Champions. Pyro had a Group 3 win in July and also achieved the Bronze level Grand Championship. 3 Beginner Novice titles(BN), 2 Companion Dog titles(CD) and several New Pack Dog titles! The biggest achievement for the year was earnig the Vesatility Award for 3 of our Girls, Comet, Boots and Windy! Beautiful weather for the first sceduled hike if the season! First timers were Pyro and Dee hiking the first 2 legs of the Novice title, in addition we had Willow and Dallas hiking for the next level Hiking title, Working Pack dog (WPD). Conformation news, Minty picked up another point towards her Championship and Pyro first time out as as Special has racked up 6 points towards his Grand Championship. "Boots" passed her first CD (AKC companion dog) leg the Suffolk Obedience Training Club trial held on 2/9/2014 In addition "Dee" and Pyro" earned 2 legs each towards thier Rally Novice obedience Title, Dee with a first placement and Ptro with 2 third placements! "Pyro" Matterhorns Burning Down The House goes Best Puppy in Sweepstakes AND Grand Futurity Winner! He also earns a Rally Novice leg! "Dune" Earns her first rally leg at 6 mos of age with a score of 97! also placing in her very large 6-9 mo class in all classes. Her brother "Clint" places 1st in most of his 6-9mo clsses, including Best of Opposite in the Jr Class Futurity. As a team Dune and Clint place 1st in the brace class! "Yuri" is awarded Top producing Sire for 2012 with 9 Champions! I am awarded, once again the Breeder's Cup award for the 5th straight year in a row!!!! Dee earns a PT leg and Dallas earns his 2 nd leg to finsh his Pre-Trial tested Title! Nova a 3 point major and Stormy a 3 point major! Pyro finishes his Championship at the tender age of 13mos! Pyro earns 3 majors in a row going BOW ! Boots finishes up her Rally Novice title with a perfect score of 100 and a 96! Pyro gets his first point at 10 months old on 4/6 with a 4 point major win! We finished up the filming of the Discovery Channels show "Too-Cute" on April 19th with the pupies going to thier new homes, can't wait to see the show. Should air sometime later this year, will post an announcement! Baril and Peter do it again! another 5 point major win at the CT River Working Group Show taking Best of Winners and an Award of Merit! so proud of them! Boots earns a Rally Novice leg 2/10/13! FIlming begins for the 3 rd season of the Discovery Channel's "Too-Cute"
Matterhorn's Big Hunk O Love at 13 mos earns his first point with a 5 point major, owner handler by his Dad Peter Zeigler! Dallas and Comet earn a pack dog leg at the Snow hike in MA! Dallas is WInners Dog for back to back 5 pt majors! On Sunday he was best puppy in sweepstakes! He also earned his Junior Herding Dog on Friday!! Comet earned her JHD and recieved an Award of Merit on Sunday! 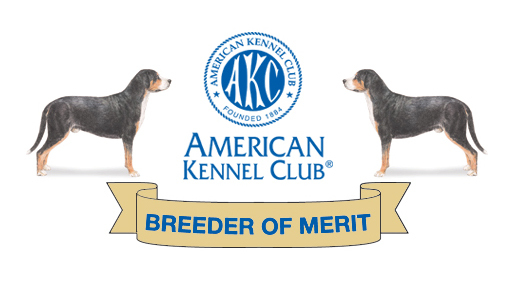 Comet passes the 2nd Pre-trial AKC Test on sheep giving her her PT title! National Specialty week News and Brags! Once again I received the Breeder's Cup award for 2011! Molly recieved an award for producing the most progeny with working titles! "Recon" Painted Mountain's Reconassiance went Best puppy in Sweeps at the Independent Regional and Best Puppy in Sweeps at the National Specialty. He was also Winners Dog at the National Specialty! Recon was bred By Lisa at Painted Mountain GSMD he is out of our boy Yuri! Ch Matterhorn's Blumen, owned By Troy and Irene passed the open Draft Test adding yet another title to her name, she also pulled for a 10x leg.! We couldn't be more proud of their accomplishments! 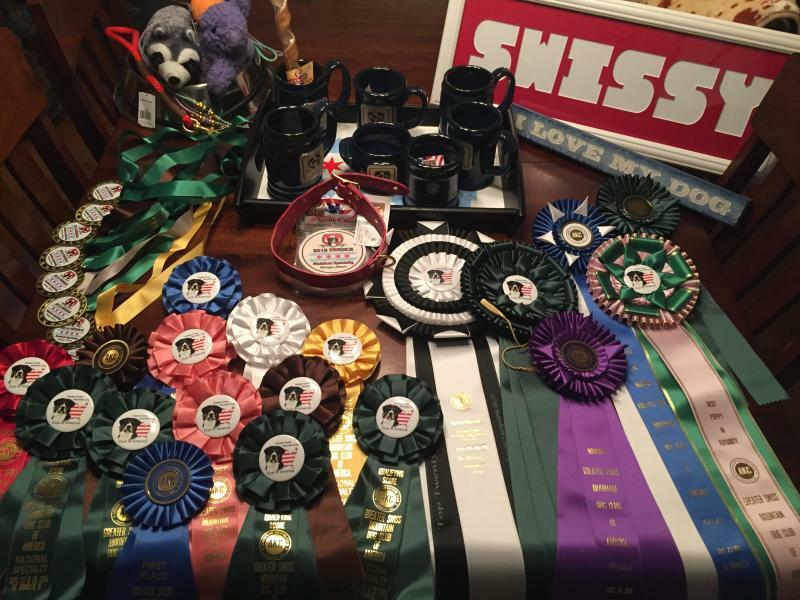 Windy completes her Grand Championship in Harrisgurg! Hailey's puppies have arrived! August 13th! Dallas picks up 2 more Championship points! Hailey was bred to Bogi mid-June! Lizzie x Yuri puppies have arrived 5 girls and 4 boys! Contact Amber and Mike Rusk at www.crownswissies.com for more information. Hailey, Dallas, Boots, Molson and Willow all pass their OFA evaluations for hips, elbows and shoulders! SCONE weight pull results: Hailey earns 2 10X legs! Comets puppies are here 3 boys and 1 girl! 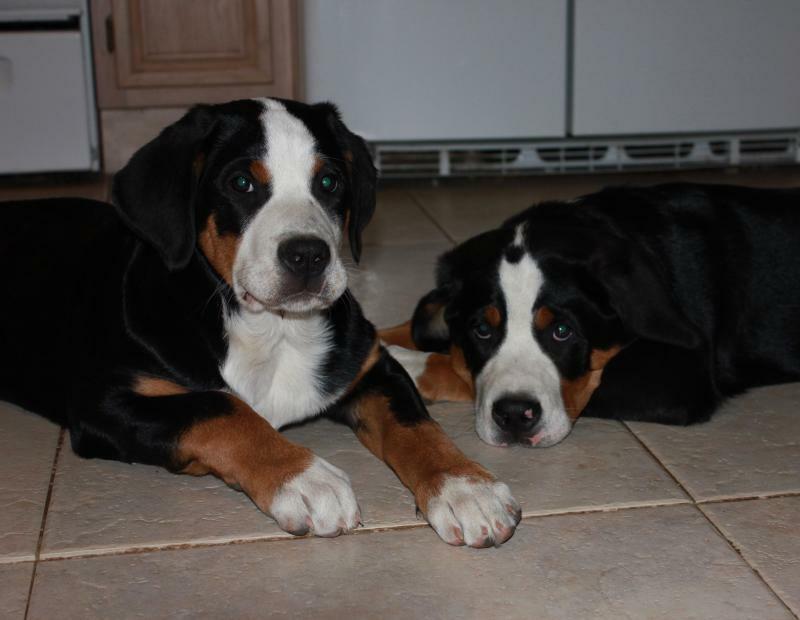 Yuri was bred to Lizzie, see the upcoming litter page for more information! C & P Draft Trial results: Raven and Windy both qualify in the Novice Draft Dog Test at their first trial! Raven went on to qualify the following day in the Open Draft Test! Lester and Mary also qualified in the Novice Draft Dog Test, this was their very first trial ever for both of them, so proud of their accomplishments! Raven earns her CD and her Versatility (VGS) tiitle! Windy and WIllow each had 2 qualifying Rally Novice legs. Willow and Hailey picked up 2 more point towards their Championship! Comet has been bred to George! See the upcoming litter page for more information on this exciting litter! Comet and Dallas earned their Rally Novice titles on March 18th, Comet finished up with a perfect score of 100! February 12th Raven earns 2 CD legs and 9mo old Dallas earns 2 Rally Novice legs at am/pm Obedience and Rally trial! Starting off the year right with some obedience and working events! Comet gets her first weight pull leg handled by Alex! and "Jackson" Matterhon's Bubbalicious earns his 3rd 10 x leg and also the most weight pulled on Sunday. Comet and Hailey both earn their Novice Working Pack Dog Titles (NWPD) Brother Oscar gets his Grand Championship. Helios earned his working pack dog title(WPD), Yuri gets his Rally Novice ttile (RN), "Molson" CH Matterhorn's Mr. Goodbar finishes out the year with his Championship and his NWPD title! Halo Passes her Novice Draft Dog Test and passes the Open Test the following Day! Halo's daughter Comet passed the Novice Draft dog test on Sunday. Matterhorn's Mr Goodbar "Molson" is the Grand Futurity Winner﻿! Yuri Earns a Rally Novice leg along with Ch Mattterhorn's Stealth Bomber "Lester", CH Matterhorns Cronus Heart o'Glenmaddy "Marty" and Matterhorn's Cotton Candy "Candy"
Molly gets 1st place in Veterans obedience! Weight pull results: Helios earnns his Working Weight Dog (WWD) and also a 15X leg! For the third year in a row I recieved the GSMDCA's Breeder's Cup Award for 2010! Yuri gets his Grand Championship on October 1st 2011, and gets inviuted to Eukanuba along with 5 other Matterhorn Swissys from the Bred-by-Exibitor class!